The Lady Vols for many years have been the gold standard for basketball at the University of Tennessee. Their exploits have overshadowed the men. But this year they are struggling while the men are ranked number one in the nation. Throughout much of its history Tennessee was the rare school whose women’s basketball team was more the gold standard than its men’s squad. at UConn, where Geno Auriemma has won 11 titles, been national Coach of the Year eight times, and won 1,042 games beginning this season, the men have won four NCAA titles. But Tennessee’s men have never made an Elite Eight, let alone a Final Four. They didn’t achieve that even in the heyday of Ray Mears, despite the heroics of Bernard King and Ernie Grunfield. By contrast, under Pat Summit, the Lady Vols won eight titles and she became the wins leader among all coaches, men or women, with1,098. However this year the team’s roles are reversed. The men are ranked number one for only the second time in school history. After Saturday’s 83-66 romp over West Virginia they are chasing a second straight SEC title and a prime NCAA Tournament spot. After last Thursday’s dreary 77-62 loss to top ranked Notre Dame, their sixth in a row, the Lady Vols are just 12-7. They came into Sunday’s home game with LSU 1-5 in the SEC, tied for last with Vanderbilt and Florida. The men’s head coach Rick Barnes is a top candidate for national Coach of the Year. Holly Warlick, a former star player, Summit assistant and personal choice as her successor, is under heavy fire. 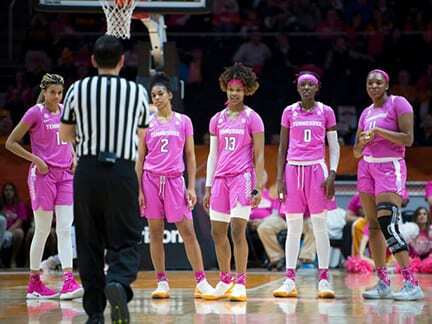 The Lady Vols have lost five straight conference games for the first time in 49 years, and their streak of making 37 straight NCAA Tournaments is in jeopardy. How the rest of the season plays out for both teams should be quite fascinating.